Both players had sat at this very table here in Lille before. Both had won their match then, on their way to a 9-1 score so far. Now, however, only one of them could be a winner. England's Richard Bland brought Delver of Secrets to the fight, while Hall of Famer Gabriel Nassif was playing the French mono-black Zombies deck. Nassif started with Vault Skirge on turn one, Bland had Ponder. He pondered for a bit, then shuffled his library and drew into the unknown. A second Ponder found the namesake, Delver of Secrets soon-to-be Insectile Aberration, but Nassif had Go for the Throat at the end of Bland's turn, and summoned Geralf's Messenger on his. Bland cast Geist of Saint Traft, Nassif attacked with his 1/1 and 3/2 to put Bland at 12, then made Diregraf Ghoul and Highborn Ghoul . The latter was returned to its master's hand via Vapor Snag and Geist of Saint Traft along with its Angel token got in for 6 damage of their own. Nassif attacked with his team and had his Geralf's Messenger returned by Vapor Snag as well, leaving Bland with two lands untapped. Post-combat the French player thought long and hard, then walked right into the clearly signalled, potentially bluffed Mana Leak. Bland did indeed have the counter for Geralf's Messenger. Then on his turn, Bland made Sword of War and Peace, attached it to his Geist of Saint Traft, and swung in for a total of 11 damage. Nassif was forced to stay on defense. He managed to trade away all of his creatures except for the Vault Skirge to get rid of the 4/4 Geist. Bland had a hexproof replacement in Invisible Stalker, but now Nassif had a Sword of War and Peace of his own, which in combination with the lifelink of its bearer, the Vault Skirge, provided a much-needed reprieve. Nassif was soon pulling ahead in the battle of Sword against Sword. Delver of Secrets, for which Nassif had Go for the Throat, was all Bland was able to muster, and it wasn't enough. Bland started on Gitaxian Probe and saw Ratchet Bomb, Vault Skirge, Lashwrithe, and Swamps. He continued with Island and Ponder, while Nassif summoned his Vault Skirge. Nassif tried Ratchet Bomb, Bland stopped it with Steel Sabotage, then cast Timely Reinforcements for three tokens and 6 life. The 1/1s—three on Bland's side, one with lifelink on Nassif's— just traded blows for a while. After a couple of turns of this, Nassif added Gravecrawler to his team, while Bland added Snapcaster Mage, flashbacking Gitaxian Probe, to his. Nassif killed the Mage with Go for the Throat, Bland killed a newly-summoned Highborn Ghoul with Dismember. Vault Skirge and Gravecrawler slowly turned the damage race in Nassif's favor, but Bland cast Sword of War and Peace, then used Snapcaster Mage on Steel Sabotage to counter Nassif's equipment—the Lashwrithe Bland had seen on turn one and always played around since then. Unarmed Zombies against armed Soldiers didn't seem to be a fair fight. No matter what the movies have to say about the match-up, here the Zombies lost. With just eight minutes left in the round, both players sped up their game considerably and their decks seemed to be in on that, too, especially Nassif's. Diregraf Ghoul, Gravecrawler, and Highborn Ghoul put Bland on the clock. Meanwhile, Bland assembled the fearsome combination of Invisible Stalker and Sword of War and Peace, but Nassif followed his impressive start with an equally impressive turn-four play: Lashwrithe was attached to Diregraf Ghoul and the attack put Bland at 2. The first attack with Sword of War and Peace made that 8. Bland debated whether to play anything post-combat, but decided to keep his cards in hand, relying on Vapor Snag off his one untapped land to survive the next attack. However, when Nassif had a second Lashwrithe which allowed him to attack with a 6/6, a 6/1, and a 2/1, that clearly wasn't enough. As the Day 2 metagame overview showed, the current Standard format is very diverse – the list of raw data contained as many as 33 separate archetypes! While this is exciting, the fact that there are so many viable decks to choose from can be quite daunting. With this in mind, I set out to break the metagame down into more manageable pieces. If we lump several archetypes together (e.g., consider UB Zombies, Mono-Black Zombies, UBR Zombies, and RB Zombies together as a grand "Zombie" archetype), we get the following picture: In the lead are white Human decks (including both versions that splash blue for Moorland Haunt, as well as versions with a token theme that are splashing black): roughly 19% of the Day 2 participants here in Lille are running Champion of the Parish. Next up, we have a tie between Delver decks (both Blue-White versions and the Lingering Souls variants), slow control decks (Blue-Black Control, Esper Control, etc. ), and Strangleroot Geist Aggro (spearheaded by Red-Green Aggro, but also including Mono-Green and Green-White versions): each of these three grand archetypes account for 16% of the Day 2 metagame. Further down the list, we see that roughly 13% of the Day 2 players are piloting Ramp decks (Green-Red, Green-Black, etc. ), 11% are playing Zombies, and 6% are playing Frites. That rounds up the top archetypes here in Lille. The remaining archetypes are all fringe, including the Mono-Red deck that I advocated as a good choice for the current Standard metagame. 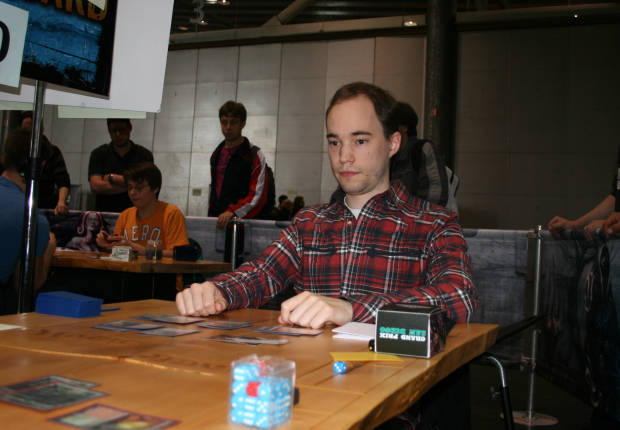 Hardly anyone played it on Day 1, and only one brave player – Asboern Anthonsen – made it to Day 2 with Mono-Red. He's currently not in a likely position to make Top 8; thus, my prediction that at least one Mono-Red deck would make it to the Top 8 is unlikely to come true. Instead, the metagame analysis suggests that we'll probably see a bunch of Human decks in the Top 8, although it's still too early to tell definitively. As I went through the decklists, the sideboard of various Frites decks stood out to me. Frites is a popular choice among the French players here today, and some of them included a surprise in their sideboards: the possibility to "transform". The idea is that you take out various reanimator cards and bring in Thrun, the Last Troll, Strangleroot Geist, Grim Lavamancer, Phyrexian Metamorph and/or Sword of War and Peace. This allows you to approach game 2 from a completely different angle, putting a lot of pressure on your opponent with cheap, hard-to-kill threats, while your opponent is hopefully stuck with now-useless Surgical Extractions and Grafdigger's Cage in hand. It's a great way to sidestep the hate. Among the players running this funky sideboard are Raphael Levy and Elie Pichon. I briefly sat down with Hall of Famer Raphael Levy to ask how the sideboard has been for him this weekend. "It has been very good for me", Raph said. "Surgical Extraction just wrecks you otherwise, but now I don't really care about it. Also, Strangleroot Geist and Thrun, the Last Troll are extremely difficult to deal with for many decks." Both Richard Parker from England (with an 11th place finish at Pro Tour Valencia to his name) and Grzegorz Kowalski from Poland have their sights set on their first Grand Prix Top 8. Parker, currently the sole undefeated player at 12-0, is playing Blue-Black Zombies – a deck that is designed to curve out with a creatures and to finish off the opponent with Geralf's Messenger and Mortarpod. Kowalski, at an excellent 11-1 record, is running Wolf Run Ramp. Parker got to play first, and started strongly with Diregraf Ghoul and Geralf's Messenger. Kowalski, on the other side of the table, was deploying Sphere of the Suns and Solemn Simulacrum to get ahead on mana. Parker used his fourth turn productively: he played Geth's Verdict to clear the way and added Phantasmal Image copying Geralf's Messenger to the board. This blazingly fast start already took down Kowalski to 6 life, and it looked like the Polish player was in trouble. The best come-back he could muster was Huntmaster of the Fells, but it was not enough. Another Geralf's Messenger and Mortarpod from Parker was enough to convince Kowalski to move on to the next game. While shuffling Parker's deck, Kowalski noticed that some of Parker's cards were facing the wrong direction, and called a judge to verify that there was no pattern. Parker explained that he must have shuffled his cards from last game back into his deck upside-down by mistake. The judge at the table checked the deck, ruled that there was indeed no pattern, and instructed Parker to make sure that all of his sleeve openings are on the same side of his deck. After that, we were underway again. Kowalski mulliganed down to five in search of a keepable hand, with Parker going down to six cards as well. A Sphere of the Suns accelerated the Pole into a third-turn Huntmaster of the Fells, while the Brit started with Fume Spitter and Diregraf Ghoul. When Parker attacked with both of his creatures on turn 4, Kowalski thought for a while before eventually trying to get rid of the 1/1 Fume Spitter by blocking it with his 2/2 Wolf token. Parker, however, had plans for his Fume Spitter: he sacrificed it targeting Huntmaster of the Fells, and a post-combat Mortarpod dealt the second point of damage to kill the werewolf. On the next turn, Diregraf Ghoul and the Wolf token traded; as a result, the board was completely swept clean again, save for a Mortarpod that remained on Parker's side of the table. A Geralf's Messenger from Parker next dealt a ton of damage to Kowalski, before dying (twice) in a flurry of burn spells. A couple turns later, an interesting situation arose: Kowalski board consisted of a freshly summoned Inferno Titan and an untapped Inkmoth Nexus. Parker had two Geth's Verdict and a Phantasmal Image in hand, with only enough mana to cast two of them. Parker could use Phantasmal Image to copy his opponent's Titan and subsequently try to kill the Titan with Geth's Verdict, but the end result of that play would be that Kowalski would lose his Inkmoth Nexus instead and that Parker would lose his Phantasmal Image to Kowalski's Inferno Titan attack trigger. Thus, Parker just cleared his opponent's board with double Geth's Verdict. Parker drew another Phantasmal Image on his next turn, now stuck with two of them in his hand and no creatures to copy in sight. Kowalski eventually drew a creature in Primeval Titan, searching up Kessig Wolf Run. This gave Parker the opportunity to put his Phantasmal Images to good use. However, Kowalski's Wolf Run could shoot down one of Parker's 6/6 Images by just targeting it, and Kowalski did just that before passing the turn again. Parker drew Geralf's Messenger on his next turn, and given that his Polish opponent was already down a single-digit life total, the Brit saw the following sequence of plays to win the game that very turn: he started by casting Geralf's Messenger and equipping it with Mortarpod. He subsequently attacked with his Phantasmal Titan, which was promptly blocked by Kowalski's real Primeval Titan. Mid-combat, Parker sacrificed his Messenger to deal one damage to his opponent, and followed it up with a Tragic Slip on Kowalski's blocker. This allowed the Phantasmal Titan to trample for lethal damage. Excellent timing and a Morbid way of winning the match! Richard Parker is currently the only undefeated player with a pristine 13-0 record. As he only had one bye, this translates to an impressive 12 match wins in a row! Grzegorz Kowalski falls to 11-2,; although he's still in a fine position, he will likely have to go undefeated from this point forward in order to make the Top 8 cut. Matthew Costa is not only a Pro Tour Top 8 competitor and Grand Prix champion, but it appears he's also one very nice guy. After his win at Grand Prix Baltimore a week ago, he was contacted by Germany's Sascha Schwarz through Magic Online who asked him about his deck, its match-ups, and advice on how to play it. Schwarz planned to play Costa's deck this weekend, and he was happily surprised to find Costa willing to share his insight. "He even wrote me an email and explained his sideboard choices," Schwarz said. "That was so cool. Also, what he told me about R/G Aggro completely transformed my view of the match-up. For example, he said that Mana Leak, if used correctly, was way better than you might think it would be against an aggressive deck, and that Vapor Snag was the MVP." "In a lot of match-ups, it's apparently correct to board out Invisible Stalker. So I thought: How about replacing them altogether with Midnight Haunting? But Costa told me that the preboard games are very different and that the main reason for cutting the Stalker postboard was the opponent's artifact removal. I don't know whether I would've made the connection between artifact removal and Invisible Stalker myself," admitted Schwarz, "and I'm happy Costa pointed it out." "Another example: I originally wanted to have Flashfreeze in my sideboard," Schwarz continued, "however Costa warned me about the match-up against U/B Control. It's about even—on a theoretical level—though much harder to play correctly for the Delver player. That's why Costa had Dissipate in his sideboard and why I have them too. It's still very good against R/G Ramp, but simply not as narrow as Flashfreeze." Schwarz made good use of the advice he got, and started the tournament with a clean 9-0 sweep. Final words from Schwarz: "Thank you!" As I went through the Day 2 decklists earlier today, there were several decks that looked particularly interesting to me: Blue-Black Tezzeret, Delver Zombies, GWb Titan Tokens, and Jund Pod. These decks might not be perfectly tuned yet and none of their pilots appear to be in contention for the Top 8, but they are certainly something different, and they seem like a lot of fun to play. Let's get to the lists! Grafdigger's Cage is a very good at stopping Unburial Rites and undying creatures, but against the large amount of decks that do not rely on their graveyard, it typically is an utter blank. That's where Tezzeret, Agent of Bolas comes in, turning Grafdigger's Cage into a respectable 5/5 threat. John Considine combined both cards in this interesting UB Tezzeret list. Named "Heathy at Sam this morning" on the deck registration sheet, which also lists Ben Heath and Ross Silcock as the deck designers, this Blue-Black concoction throws together the best of Delver and Zombies. A card that stands out in particular is Altar's Reap, which seems like a perfect fit for this deck; it's an instant to reveal to Delver of Secrets, it can be flashbacked with Snapcaster Mage, and it can eat Gravecrawler and Geralf's Messenger for profit. This interesting Ramp variant tries to accelerate into an early Elesh Norn, Grand Cenobite, which is completely backbreaking against many decks in the format. Instead of Slagstorm and Huntmaster of the Fells that the Red-Green ramp versions typically run, Dimitriu's deck has access to Day of Judgment, Lingering Souls, and Elspeth Tirel, which also excel at stopping aggro decks. Although the Green-Black-White color combination misses access to Kessig Wolf Run, Dimitriu makes up for that with Vault of the Archangel and Gavony Township as tutor targets for his Primeval Titan. While Lukas Blohon showed the power of Strangleroot Geist in his Naya Birthing Pod deck in the Top 8 of Pro Tour Dark Ascension, Romain Perrier must have felt that Black is better than White. Access to black certainly enables powerful cards that work very well with Birthing Pod: Geralf's Messenger is very happy to be turned into a Skinrender, while Massacre Wurm and Sheoldred, Whispering One can win games out of nowhere. Although the mana base is perhaps a bit shaky, it is certainly an interesting take on how to abuse Birthing Pod. So that's my selection of four decks to follow. If you've been looking for a fun and powerful deck to play for Friday Night Magic or Magic Online, give one of these deck a spin! Bart van Etten was one of the overnight leaders, finishing day one at 9-0 with G/W/R Birthing Pod. Kenny Öberg on the other hand barely squeezed in at 7-2, but hasn't lost a match since with his green-white aggro deck. Öberg started with Avacyn's Pilgrim off a mulligan to six which died to van Etten's Mortarpod. Öberg had his own Mortarpod for van Etten's Birds of Paradise, and summoned Blade Splicer and Hero of Bladehold over the following turns. Meanwhile, van Etten had cast his own Blade Splicer as well as an Avacyn's Pilgrim and a Strangleroot Geist. Öberg killed the opposing Golem token with Dismember and attacked with both of his creatures—or rather all four of his creatures, thanks to Hero of Bladehold. Van Etten blocked the two 1/1 tokens dead with Strangleroot Geist and Blade Splicer. His Geist returned and he also had another Blade Splicer to replace its fallen comrade. Öberg, though, had Geist-Honored Monk which threatened to take over the game. Van Etten went without play and was falling dangerously low on life when Öberg's token army came crashing in. For a second, it seemed as if van Etten's Wurmcoil Engine might be able to save him, but the next attack brought van Etten down to 4, and Mortarpod finished him off. Both players led with mana critters on their first turn. Van Etten had no play on his second, while Öberg had no land and simply cast two Avacyn's Pilgrims. On turn three, both made a four-drop: van Etten had Huntmaster of the Fells, Öberg killed it with his Garruk Relentless. The resulting Garruk, the Veil-Cursed, however, was taken down by van Etten's Wolf token. Öberg made Mirran Crusader, van Etten had another Huntmaster of the Fells and a Mortarpod. Öberg equipped his Crusader with Sword of Feast and Famine, and took van Etten from 24 to 16, making him discard Elesh Norn, Grand Cenobite and Strangleroot Geist in the process. Next, there was a little intermezzo when van Etten's Oblivion Ring exiled Öberg's Sword and Öberg's Oblivion Ring exiled van Etten's Oblivion Ring to free up his Sword. Van Etten shot one Avacyn's Pilgrim with Mortarpod and shot Birds of Paradise with a newly-transformed Ravager of the Fells. Mana was not a big problem for Öberg anymore, though, as he had drawn a third land and got help from Sword of Feast and Famine as well. Mirran Crusader continued to apply pressure and was joined by a new Birds of Paradise which picked up Sword of Feast and Famine and threatened lethal damage on Öberg's very next attack. Van Etten went for one last-ditch attack himself, powered by Gavony Township, but he had to hope for Öberg to severely screw up his blocks. Öberg didn't—and won. Kenny Öberg continues his day 2 winning streak. As requested on the Cover-It-Live-stream: two more bonus decklists! By popular demand, I have Gabriel Nassif's Mono Black Zombies list and Robert van Medevoort's Mono Green Aggro decklist. Both decks don't toy around with nonbasic lands, going for an all-Swamp or all-Forests manabase instead, and both decks try to quickly rush out of the gates with aggressive early drops. Nassif's list (designed by Sylvain Lauriol) is very similar to Mark Dictus' Zombie deck, which was featured yesterday. There are a few small differences, however. Firstly, Nassif has Vault Skirge where Dictus has Fume Spitter. Secondly, Nassif has extra lands along with additional copies of the fearsome Lashwrithe and Phyrexian Obliterator, where Dictus has reactive cards in Liliana of the Veil and Ratchet Bomb. And finally, Nassif has extra Sword of War and Peace instead of Dictus' Cemetery Reapers. The prospect of suiting up a Vault Skirge with Sword of War and Peace is pretty exciting. With Nassif having overtaken Dictus in the standings, it is very well possible that the above card choices will become the standard for Mono Black zombies in the future.